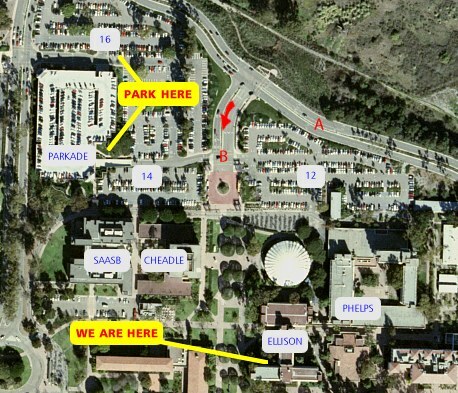 The UCSB campus is 10 minutes west of downtown Santa Barbara (see UCSB location map at right). 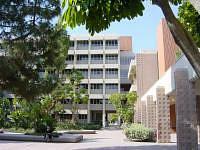 VITAL is located at 1629 Ellison Hall, south of Parking Lot 12, grid cell D4 on the campus map. Meetings are usually in the Geography conference room at the south end of Ellison Hall, right across from the elevators, in room 5824. Take 217 South. It ends at the east entrance to UCSB. The speed limit drops from 65 to 25 mph. Turn right at the campus gate and follow Mesa Road along the northern periphery of campus. Pass the first set of lights, which may not be operational yet. This puts you at A in the photo below, approaching a second set of lights. Turn left at the lights. This brings you to point B. The best parking option is the multi-story parkade to your right, or Lot 16. 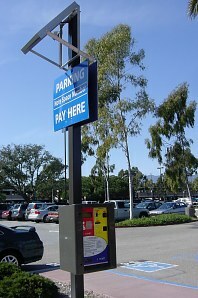 Note your spot number and register at a parking kiosk. Fees start at $2. Other options: For visits under an hour, Lots 12 and 14 have parking meters. There are also numbered spots in these lots, but visitors may not use them during school hours. UCSB is adjacent to the airport. This will be a very short drive. Turn right exiting the airport car rental lots, head south for just a few seconds on Fowler Drive, following signs for Santa Barbara. The mountains should be behind. Ahead, beach palms and an overpass. Turn left on the ramp to 217 South (before the overpass). Merge to 217 South. The east gate of campus comes up in seconds. Follow directions above. Exit at Los Carneros, turn right (south), drive past Hollister. Turn left on Mesa Road. In the photo above, you'll be approaching from the northwest. Turn right at the light after you pass the parking lot on your right. That brings you to point B in the photo. See the parking options above. 217 ends at East Gate. Turn right.